What does a legendary billionaire know about selling? Turns out, a lot! Recently I had a chance to interview Tom Searcy, co-author of How to Close a Deal Like Warren Buffet, about that very topic. (Click here to download the first chapter.) I think you'll enjoy his fresh perspectives. JILL: Tom, Warren Buffett is known as a mega-savvy investor and the CEO of huge corporation. Clearly he’s in a whole different league from most people. 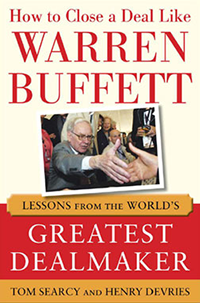 How does Buffett fit as an example for salespeople? Tom Searcy: There's a lot to learn from Buffett. Having read every word he's ever written and most that have been written about him, there's a core of solid business wisdom to be accessed. His business operator mind is what separates him from most investors. Henry and I wrote this book to help people see the actual process and strategies of making big sales at the Buffett level and how they can be applied in making their own biggest sales. JILL: Great idea. I'm glad you did all the reading for us. You're saving us tons of research time and ferreting out the key takeaways. In your book you say a key lesson from Buffett is to "Go Big." Why do you/he advocate targeting big deals? Tom Searcy: Big deals change you and your company by changing what you believe is possible. It often takes the same energy and time to land a big sale as it does an average or small one. As an investment of time, you should always be looking for the greatest returns on your investment. Going big gives you insight into opportunities that change your perspective on your entire business and marketplace. By focusing on these big deals, you grow faster and get better at all transactions. JILL: Another one of Buffet's deal-making lessons that you cover in your book is to "Consider Many, Like Some, Love Few." Can you explain what that means? Tom Searcy: Buffett sometimes speaks of Ted Williams, known as the greatest hitter of all-time, when he talks about making decisions about what deals to pursue. Williams broke down the strike zone for a baseball hitter into 77 cells, each cell the size of a baseball. He calculated that there were only 9 cells in that zone that had his highest yield opportunities to hit if a pitch came into the strike zone. Buffett uses the same type of thinking. He knows that even though he could make lots of deals, his best opportunities for real success are few in number. By knowing his own filter of characteristics for the perfect opportunity, he can be patient and not take every deal. He waits for the ones he can knock out of the park. JILL: Good analogy. When we were talking earlier, you said that one of your favorite Buffettisms is that “Bad Deals at Good Prices Are Still Bad Deals.” What are the deals you should beware? Tom Searcy: For Buffett, there were a number of indicators. You can’t do good business with bad people. Integrity and a reputation for that integrity are critical to Buffett when considering an opportunity and the same should be true for everyone. If it’s only about the money, it is often not a good deal. That’s an auction and if all you are bringing is money to the table, then nothing else will be valued. The same is true when you are selling. If all you can bring is the lowest price, then the buyer will trade you for a lower price at a future time. Most great deals are done relatively quickly. If a deal or a sale drags out for a long time, it's negative indicator. One of the parties is not putting energy behind getting things done. That could be because of fear, bad chemistry or competitors. By having a filter in place to weed out the bad deals and sticking to that filter regardless of how much you want the sale or the deal, you can avoid a lot of bad deals. JILL: Seems like Buffet had lots of criteria he used for pursuing opportunities -- which makes lots of good sense to me. In your book, you also said that Buffett is a lover not a fighter. What do you mean by that? Tom Searcy: Fighting with the very people with whom you want to do business is going to make finishing a transaction and then moving forward together positively, a real problem. In addition, if you're a fighter, you get a reputation as someone whose hard to work with. Staying on the high ground of reasonableness, thoughtful consideration of all of the interests of the people involved and keeping communication open creates a reputation and an environment for you that allows for future deals regardless of the outcome of any single event. JILL: Another interesting lesson from Buffet is to "Know that the Why Matters." Why is this so important to uncover early on in deal-making conversations? Tom Searcy: If all that matters is price, then no matter what process is followed it is just an auction. However, if you know the real motivators of the buyer or seller, you can form a strategy. Warren Buffett didn't become the second richest man on the planet by paying top dollar in an auction setting for companies. He's a great salesman. He almost always determines the real motivations of the people with whom he is going to do a deal and focuses on getting them what they care about. Sometimes it is speed to an outcome. Many times it had to do with how things would operate after the sale. By knowing in advance what their “why” was, Buffett tailored his offer and was able to make his deal for less money than others were willing to pay. That's selling! JILL: Is there one deal that you think embodies the Buffett genius? Tom Searcy: There are so many deals to choose from, but one I like best is when Buffett bought Helzberg Diamonds from Barnett Helzberg. Buffett truly understood the business he was looking at buying, the issues of the owner who was selling and the core motivators past the purchase price of the transaction. He personally handled the transaction, developed the relationship and wrote the terms out so as to address the issues of Helzberg. I have to give credit to Helzberg though. He got Buffett to pay in stock in Berkshire Hathaway rather than cash. Buffett would have preferred a cash deal, but because of Barnett’s savvy, the value of the transaction price has multiplied over six and a half times in the seventeen years since it transpired. JILL: I'd sure like to have been involved in that deal! And, clearly, us normal human beings have a lot we can learn from Buffet. Thanks Tom for sharing your insights today. Click here to learn more about How to Close a Deal Like Warren Buffet.